Corporate Events, Sports Presentation Days, Team Building Days. The Human Table Foosball Combo gives you two game options in one inflatable. It is a combination between playing foosball and basketball. Play a traditional game of foosball OR our supervisors can remove the straps so a game of basketball can be played with the provided hoops! Make sure you assign teams and have them play each other the day of the event. Otherwise, the arena will become a bounce house, or the games will become boring with not enough players and children leaving mid game. Up to 12 players can partake at one time. 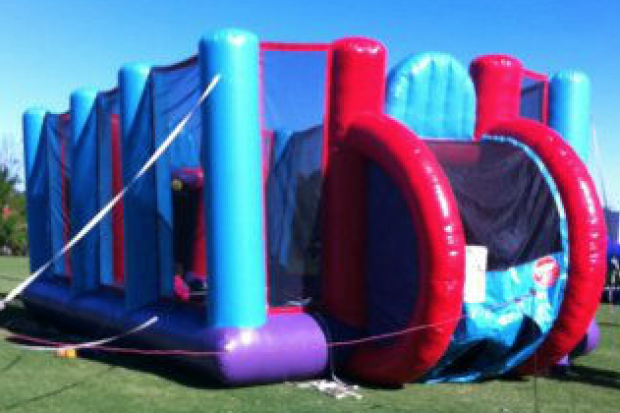 This is a great inflatable for team building, sports presentations, school fetes, and backyard parties. Book this one early, it has become popular in recent years. If you’re looking for something a little bigger, see our human table football. Not to mention the biggest and best soccer inflatable in Sydney; the bubble soccer arena. We just require direct vehicle access to the set up area. If you don't have the minimum access please contact us on 98298929 to discuss alternatives.